Johnny-come-lately here. I ran into the same problem that others have while upgrading from FIM to MIM. You can find the references below; they refer to a download for a Microsoft.IdentityManagement.DatabaseUpgrade.exe.config file. However, I couldn't find a link to actually download the file, so I did a bit of forensics and compared the config file from the SP1 update to that from RTM. I merged the relevant parts and BANG!, the installation succeeded. To save everyone else the trouble, here are the before and after files; and my relevant installation notes are below. There is a problem with this Windows Installer package. A program run as part of the setup did not finish as expected Contact your support personnel or package vendor. msiexec /i "E:\Service and Portal\Service and Portal.msi" /L*V "D:\Install\Service and Portal.msi-%datetime%.log"
MSI (s) (60:5C) [18:21:01:739]: Note: 1: 1722 2: UpgradeDatabase 3: C:\Program Files\Microsoft Forefront Identity Manager\2010\Service\Microsoft.IdentityManagement.DatabaseUpgrade.exe 4: /ConnectionString:"Data Source=MY-SQL-ALIAS;Initial Catalog=FIMService;Integrated Security=SSPI;Pooling=true;Connection Timeout=225" /FimServiceAccountName:"MYDOMAIN\-svc-fimsvc" /FimServiceDatabaseName:"FIMService"
Error 1722. There is a problem with this Windows Installer package. A program run as part of the setup did not finish as expected. Contact your support personnel or package vendor. 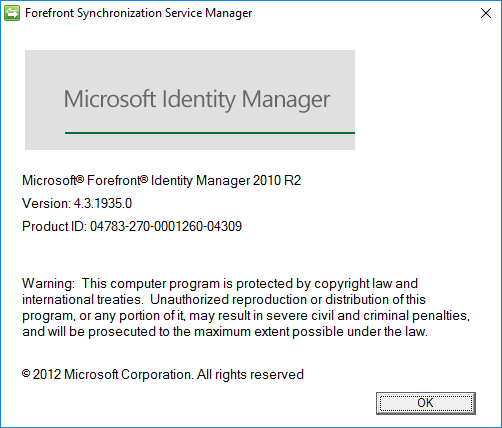 Action UpgradeDatabase, location: C:\Program Files\Microsoft Forefront Identity Manager\2010\Service\Microsoft.IdentityManagement.DatabaseUpgrade.exe, command: /ConnectionString:"Data Source=MY-SQL-ALIAS;Initial Catalog=FIMService;Integrated Security=SSPI;Pooling=true;Connection Timeout=225" /FimServiceAccountName:"MYDOMAIN\-svc-fimsvc" /FimServiceDatabaseName:"FIMService"
MSI (s) (60:5C) [18:21:35:553]: Product: Microsoft Identity Manager Service and Portal -- Error 1722. There is a problem with this Windows Installer package. A program run as part of the setup did not finish as expected. Contact your support personnel or package vendor. 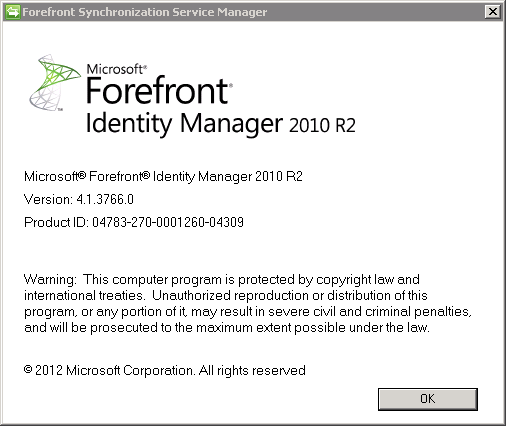 Action UpgradeDatabase, location: C:\Program Files\Microsoft Forefront Identity Manager\2010\Service\Microsoft.IdentityManagement.DatabaseUpgrade.exe, command: /ConnectionString:"Data Source=MY-SQL-ALIAS;Initial Catalog=FIMService;Integrated Security=SSPI;Pooling=true;Connection Timeout=225" /FimServiceAccountName:"MYDOMAIN\-svc-fimsvc" /FimServiceDatabaseName:"FIMService"
"D:\Install\Service and Portal\Program Files\Microsoft Forefront Identity Manager\2010\Service\Microsoft.IdentityManagement.DatabaseUpgrade.exe" /ConnectionString:"Data Source=MY-SQL-ALIAS;Initial Catalog=FIMService;Integrated Security=SSPI;Pooling=true;Connection Timeout=225" /FimServiceAccountName:"MYDOMAIN\-svc-fimsvc" /FimServiceDatabaseName:"FIMService"
"D:\Install\Service and Portal\Program Files\Microsoft Forefront Identity Manager\2010\Service\Microsoft.IdentityManagement.DatabaseUpgrade_tracelog.txt"
Microsoft.ResourceManagement Verbose: 0 : Execute SQL : The following sql statement failed. Microsoft.ResourceManagement Verbose: 0 : Execute SQL : The transaction failed with the following errors System.Data.SqlClient.SqlException: Column, parameter, or variable #1: Cannot find data type fim.ObjectKeyListInternal. Must declare the table variable "@objectKeyList". Parameter or variable '@objectKeyList' has an invalid data type. 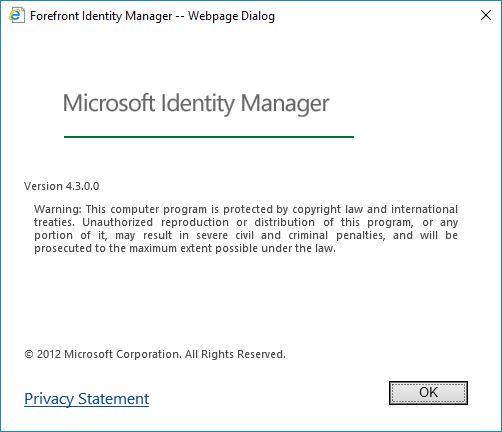 Microsoft.ResourceManagement Verbose: 0 : Schema upgrade: Completed with following errors. Microsoft.ResourceManagement Verbose: 0 : Execute SQL : The upgrade tool has rolled back. The sql transaction running the script GeneratedDBUpgradeScript.sql failed. Exception: System.Data.SqlClient.SqlException: Column, parameter, or variable #1: Cannot find data type fim.ObjectKeyListInternal. Microsoft.ResourceManagement Error: 3 : Database upgrade : Encountered errors when upgrading the database schema. 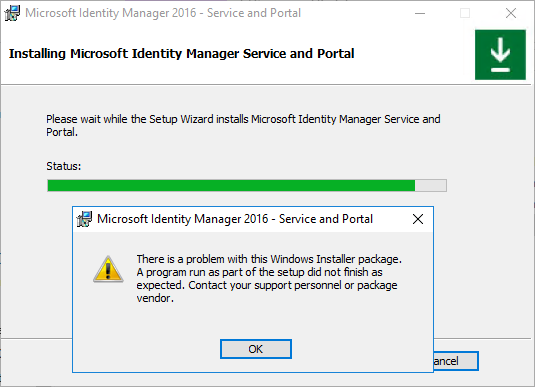 msiexec /i "D:\Install\Service and Portal\Service and Portal.msi" /L*V "D:\Install\Service and Portal.msi-%datetime%.log"
The database upgrade tool has encountered at least one error when upgrading FIM configuration objects. 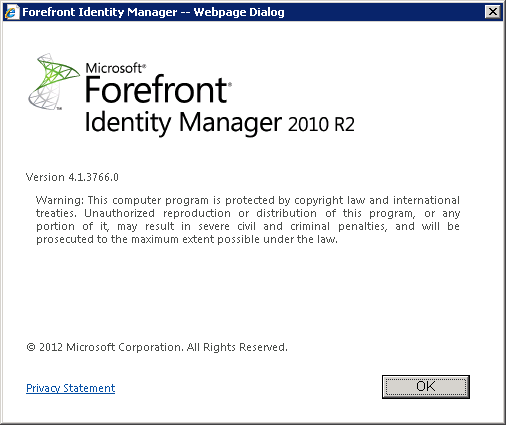 Please see the Forefront Identity Manager application event log for more detail. Microsoft.ResourceManagement Error: 3 : Reraised Error 50000, Level 14, State 1, Procedure ReRaiseException, Line 37, Message: Reraised Error 50000, Level 14, State 1, Procedure ReRaiseException, Line 37, Message: Reraised Error 2627, Level 14, State 1, Procedure PostProcessManagementPolicyRuleUpdate, Line 585, Message: Violation of PRIMARY KEY constraint 'PK_ManagementPolicyRuleAttribute'. Cannot insert duplicate key in object 'fim.ManagementPolicyRuleAttribute'. The duplicate key value is (2879, 105). Microsoft.ResourceManagement Error: 3 : Microsoft.ResourceManagement.WebServices.Exceptions.UnwillingToPerformException: Other ---> System.Data.SqlClient.SqlException: Reraised Error 50000, Level 14, State 1, Procedure ReRaiseException, Line 37, Message: Reraised Error 50000, Level 14, State 1, Procedure ReRaiseException, Line 37, Message: Reraised Error 2627, Level 14, State 1, Procedure PostProcessManagementPolicyRuleUpdate, Line 585, Message: Violation of PRIMARY KEY constraint 'PK_ManagementPolicyRuleAttribute'. Cannot insert duplicate key in object 'fim.ManagementPolicyRuleAttribute'. The duplicate key value is (2879, 105). Microsoft.ResourceManagement Warning: 2 : Request 'a3048c6f-fad9-40de-a3eb-b711439d1e6d' failed while trying to commit the changes to the database. Exception: 'Dispatch Request Failure Source: 'Other''. Microsoft.ResourceManagement Verbose: 0 : Request 'a3048c6f-fad9-40de-a3eb-b711439d1e6d' updates have been persisted to permanent storage. Microsoft.ResourceManagement Information: 1 : RequestIdentifier 'a3048c6f-fad9-40de-a3eb-b711439d1e6d' exited RequestDispatcher with RequestStatus 'Failed'. 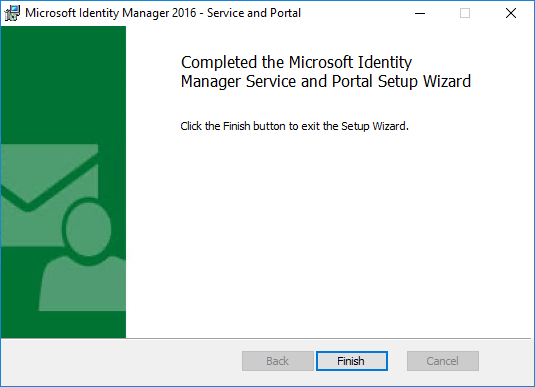 Microsoft.ResourceManagement Error: 3 : Out-of-box object import : Errors encountered when upgrading the configuration object urn:uuid:a61f2b61-4258-4a02-8fdc-840c739a4bfa. Microsoft.ResourceManagement Verbose: 0 : Out-of-box object import : Exception message. Failure when making web service call. Microsoft.ResourceManagement Verbose: 0 : Out-of-box object import : Completed processing object import file ConfigurationChange2004.xml.